So yesterday I told you about how we found our trip online. What I forgot to mention is that after we booked and before we went, one afternoon we were at a friend’s house having a drink before going to a festival. What are the changes that another couple of friends were traveling to Florida, with the same travel agency, on the same date, even taking the same flights and to top it off, booked the seats on the row behind us? Yea, so that happened. To make the coincidence even bigger, a second couple of friends also booked the same trip, but they went a month after we came back. The flight to Miami was split up in 2 because we had to make a stop at Orlando. We were flying with the Dreamliner and since both me and my boyfriend are tall people, we booked the comfort class with extra leg room. This definitely made the flight more comfortable. After a couple of hours, we arrived at our first stop, Orlando. All the passengers had to leave the plain to go through customs. After an hour, we were able to board the plane again to continue the last bit to Miami. When we arrived in Miami we had to go to the car rental spot on the airport to pick up our rental car. After first having to take a shuttle we found the right desk. The desk clerk told us that since we booked the trip under my name and I am under 25 we had to pay an extra fee per day for the insurance. This was a mistake, we booked it under my boyfriend’s name for exactly this purpose. We had to contact the tour operator in The Netherlands. The only problem was that we did not have a emergency number, so we had to find Wi-Fi by trying to find a spot at the airport at some restaurant. When we finally had the right number, we were redirected trough different departments until finally we had the right person on the phone. This whole process took us a couple of hours, and we had already send our friends to go to their hotel. The employee of the tour operator told us to give the desk clerk on the phone so they could work out the problem. When we returned to the unfriendly desk clerk, he said that he did not want to speak with the people from the tour operator and that he would just fix the problem himself. We were pretty pissed off, since he made us go through all the trouble first. We got the papers and the instruction to go to the garage underneath the building. We got a section where several cars were parked from which we could choose. 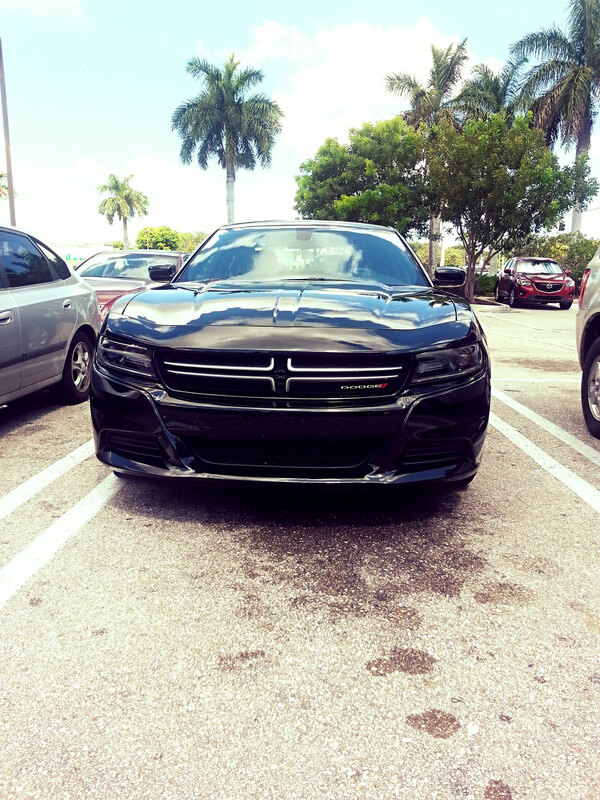 We chose a black full size Dodge Charger and drove of to our hotel for the night. 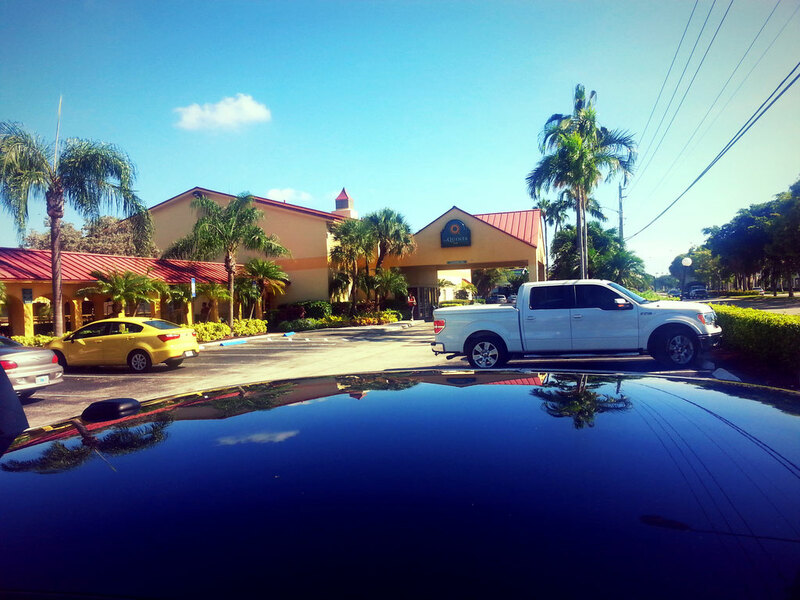 We booked a night at La Quinta, just outside of Miami in Ft. Lauderdale. We were exhausted from the trip and all the trouble, but on our way to the hotel, we passed a mall. Shopaholic as I am, I just could not resist. Since we had to eat dinner anyway, we decided to make a pit-stop. This turned into a small shopping trip. When we arrived back at the hotel, we fell asleep right away because we were so exhausted. The next morning, we woke up and went to the complimentary breakfast before we hit the road. 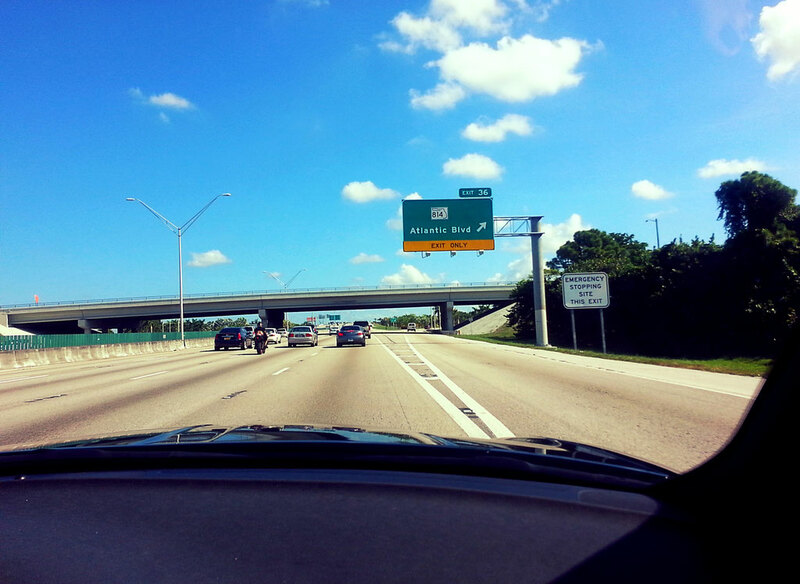 Tomorrow I will tell you about how we found our way to Orlando without navigation.